Foundation e-mail communications are proving very interesting for those trying to better understand how private philanthropy interacts with public school systems. The NPQ Newswire commented on the e-mail exchanges between representatives of Facebook’s Mark Zuckerberg and Newark Mayor Cory Booker during the planning stages of the Facebook billionaire’s $100 million donation to the Newark, N.J. school system. Now a group called In the Public Interest has done the same favor for the Foundation for Excellence in Education (FEE), founded by former Florida governor and potential presidential candidate Jeb Bush. The e-mails describe FEE activities such as helping to write legislation in Florida that would lead to more use of a proprietary test, the Florida Comprehensive Assessment Test (FCAT), marketed by Pearson, which is a FEE donor. E-mails also describe FEE pitching SendHub, a communications tool, for use in Florida schools and Rhode Island schools. 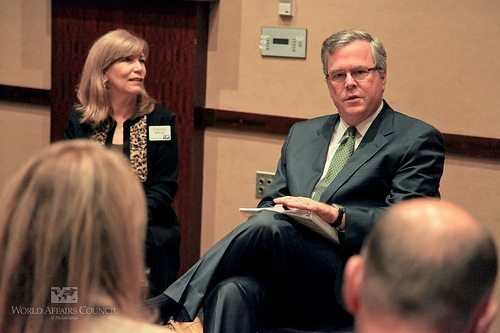 Jeb Bush is an investor in SendHub. The e-mails also showcase FEE pushing for Florida to adopt a “parent trigger” law, which could benefit for-profit FEE allies such as Charter Schools USA, a school management firm. In addition, the e-mails point to discussion about a Maine push for a cyber-schooling executive order from the state’s Republican governor, designed by Digital Learning Council, which is co-chaired by Jeb Bush and funded by for-profit firms K12, Pearson, and McGraw-Hill. In addition to corporate funders such as Microsoft, Intel, Pearson, K12, Target, State Farm, and McGraw-Hill, the e-mails reveal a number of private foundations supporting FEE or FEE events. Many of the funders are those on the hard right that one would expect to be supporting school choice issues and privatization or corporatization strategies, such as the Lynde and Harry Bradley Foundation and the Hume Foundation. However, others were much more in the line of “mainstream” or liberal funders. In 2011, FEE’s two highest paid independent contractors were both firms affiliated with the former director of the Gates Foundation’s education programming, Thomas Vander Ark: Vander Ark Associates (which was paid $105,000) and Vander Ark/Ratcliff (which was paid $150,000 for digital learning consulting). Vander Ark/Ratcliff pulled in $216,774 in 2010 in FEE consulting fees as well. Education is a big thing with the Bush clan. President George W. Bush’s most significant domestic policy achievement is undoubtedly the No Child Left Behind program that in many ways ushered in the high-stakes testing regimens that bedevil so many school systems. Brother Neil Bush had a firm, Ignite, which marketed educational software to public school systems; interestingly, the Neil Bush firm sought to sell its software to Florida to help students prepare for the FCAT exam that e-mails show FEE helped to write legislation for.